How to choose and buy a real Christmas tree and how to look after it once you've got it home. Choosing a live Christmas tree. Bringing Christmas trees into the house and decorating them was made popular in Victorian times when Prince Albert brought the tradition from Prussia (where it was already a popular custom). Artificial trees last for years and don't drop needles, but they don't produce the distinctive Christmas tree smell, aren't biodegradable, use fossil fuels in manufacture and to transport to the UK. The Forestry Commission has calculated that to grow and harvest a real trees uses about a tenth of the materials and a twentieth of the energy of that required to produce an artificial tree. Approximately 8 million 'live' Christmas trees are bought in the UK each year. Historically trees were imported, usually from Northern European countries. British growers now supply the majority of our living Christmas trees, growing and harvesting the trees in a similar way to a traditional crop. Some large parks and forestry estates also cut trees at Christmas as part of their clearance work. The Christmas tree is the heart of the home at Christmas and nothing beats the look or smell of a real Christmas tree in the house. Hopefully these tips will help you choose which tree to purchase and to enjoy your tree for longer. Norway spruce (Picea abies) - This has been the traditional British Christmas tree since Victorian times. We've been growing them in the UK for nearly a 100 years and it is the cheapest and perhaps most widely available Christmas tree. However they do lose their needles more readily if not looked after. Caucasian or Nordmann fir (Abies nordmanniana) - is now the most popular real Christmas tree as it's a bushy compact tree, with dense foliage and soft, glossy needles, unlike the Norway spruce. Nordmanns are often called 'non-drop Christmas trees' but whilst they keep their needles better, they do lose some. They can be reasonably expensive (£35-£40 for a 6-7ft tree) and don't have much scent. Colorado or blue spruce (Picea pungens) - are native of the western United States, particularly the Rocky Mountains. They have dense branches with beautiful frosty blue/green needles, they will withstand a lack of water without needle drop. If buying with roots and potting up before planting out after Christmas, they prefer a position in full sun. 'Koster' and 'Moerheimii' are two varieties grown exclusively for use as Christmas trees. 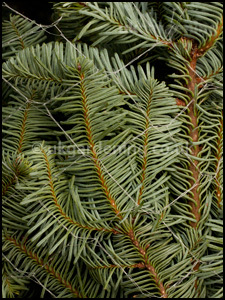 Noble Fir (Abies procera) Gaining in popularity because of its good scent and dense, blue-green, long-lasting needles. The noble fir has stiff branches, so can support heavier decorations. Their branches are also ideal for Christmas wreaths, swags and table decorations. Expect to pay slightly more than a Nordmann fir - last Christmas I bought a 5-6ft tree for £35. Other lesser used Christmas trees. Scots pine (Pinus sylvestris) - a native British tree, with long, open branches that keep their needles well, there is a bit of scent. Serbian spruce (Picea omorika) - might be difficult to find, but it is a small, thin tree with a blue grey underside to the needles, they also should have cones at Christmas. Fraser fir (Abies fraseri), will keep their needles, they have a good shape and wonderful fragrance. 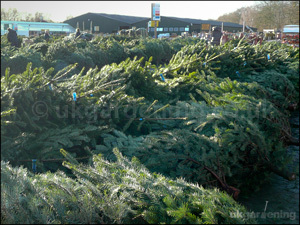 Trees are available as ready cut, pick and cut your own, bare-rooted or with a root ball. Those with roots are less prone to 'needle drop' than cut trees and can be planted in the garden after Christmas and dug up and used again next year. All of these trees will grow happily in UK gardens, if they have a good root, are treated well and planted outside soon after Christmas. If planting outside, in the garden, bear in mind your soil type, as the Norway spruce and Nordmann fir prefer acidic rather than alkaline soil. Spruces have surface roots, so if buying bare-rooted to plant in the garden after Christmas, choose one that has strong, horizontal roots. Trees are measured from the bottom of the tree to the tips of the top layer of branches (when held next to the trunk) and not to the tip of the main trunk, so make sure you choose a tree that will fit into the desired position. A few Christmas tree sellers now pre-net their trees for sale, although this is quicker to grab a tree and stuff it into the car, I'd suggest you look at trees that are unnetted - so you can see the shape of the tree and have a look at as many trees as possible, so you get your desired look. Try to find a tree that is 'A' shaped, with regular spacing between the branch layers and a leader that isn't too long. Shake the tree or run your hand up a small branch, see if you get needle drop, a fresh tree should shed few needles, and the needles should feel moist and flexible. Once you've chosen your tree, you'll should find that the seller will then net the tree for you. To tell the difference between spruce and fir, look at the cones, spruce (Picea) cones hang down from the branches whereas fir (Abies) cones grow up from the branch. Rooted trees should be 'potted up' into a large pot or container, with drainage holes, filled with general compost or garden soil as soon you get them home. Keeping them outside or in a cool room for as long as possible will reduce the chance of the tree getting stresses and dropping its needles. Cut trees should be treated like a bunch of flowers, saw an inch (25mm) off the bottom of the trunk and then put into a bucket of water, either outside or in a cool room, until you are ready to bring them indoors and decorate them. Take off any netting and give the tree a good shake, preferably outside. Bring the tree indoors and position away from any fires or radiators. The tree will drop its needles if it's too warm to conserve moisture. Place in a stand that can hold water. Check the water level daily, a six foot tree can drink up to a pint of water a day. Any needles that do drop can be used as a mulch around acid loving plants like rhododendrons, maples and camellias.